If the dog has repeated seizures there is more likelihood of brain damage occurring. Most dogs with seizures are genetically predisposed, meaning if their parents had a form of epilepsy, they are more prone to develop symptoms as well. If at all possible, locating the cause of the seizures is explored, because when the veterinarian knows the cause, they can treat your dog accordingly. Some seizures are caused by low blood sugar levels is very common in toy breeds. Another cause can be low calcium levels as well as dogs with liver disease. When the cause is understood, it makes treating the disorder more effective. There are several different routes to treating dog seizures, but if at all possible finding the cause of the seizure should first be explored. If the cause is identified, the treatment begins there. For instance, if the dog has low blood sugar levels, getting this corrected will cause the seizures to cease. If there is no underlying cause or it cannot be identified, most dogs are placed on medications specifically for controlling the seizures and preventing them from happening. Dogs with seizures can live a normal lifespan, if the condition is caught early and there is a simple underlying cause. Those dogs that have a causation cannot be found, tend to not live as long because they eventually have brain damage from continued seizures. Many dogs with continued seizures for no apparent known cause become immune to the medications, in other words, they no longer respond to the treatment so the dosages have to be increased. When your dog friend has seizures, it can be a very frightening experience to watch. 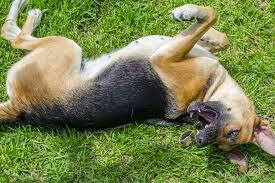 If there is no underlying cause for the seizures, your dog can possibly have a seizure at any given time. Therefore, it is essential that someone is always with the dog in case of a seizure that does not end. These types of seizures need immediate medical intervention or brain damage will surely follow.